On October 20, a new milestone for Chiang Mai aviation took place. AirAsia commenced its maiden flight to Chiang Mai from Kuala Lumpur, becoming the first airline since 2001 to offer daily flights between KL and the northern Thai city. Passengers on flight AK896 were given a welcoming ceremony held at the airport. (From left) ‘Dato’ Tony Fernandes, group chief executive Officer of AirAsia Berhad, Thongchai Wongrianthong, vice governor of Chiang Mai and Junnapong Saranak, director of the Tourism Authority of Thailand (TAT) Northern Office, Region 1. Tony Fernandes hands a token of appreciation to Junnapong Saranak in the presence of the colorfully dressed air hostesses. The fares for flights between Chiang Mai and Kuala Lumpur are THB 999 one way. 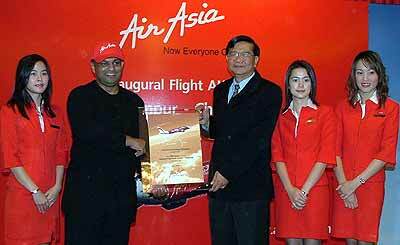 To book seats on AirAsia’s Kuala Lumpur-Chiang Mai flights, log on to www.airasia.com or through mobile booking mobile.airasia.com., but be aware that all fares quoted are excluding airport taxes and fees, and are applicable for travel one way only. Junnapong Saranak, Director of the Tourism Authority of Thailand (TAT) Northern Office, Region 1, said, “The introduction of direct flight from Kuala Lumpur to Chiang Mai has come at a most opportune time, poised to reap the up-trend in year-end travels for numerous festivals like Loy Krathong Festival during 15-17 November 2005 and also the grand opening of Chiang Mai Night Safari. I am most confident that the shorter traveling time and convenience of flying directly between Kuala Lumpur and Chiang Mai will attract more Malaysians to visit us. Khun Yuam district chief officer Samrit Swamipak has said that preparations are ready for the Mexican Sunflower Festival 2005, which will be held at Doi Mae Oo Kho. There will be a local food contest, stage performances, a Miss Mexican Sunflower contest, and hill tribe performances from Karen and Hmong groups. The flowers are blossoming well, said Samrit, with the blooms especially large because of all the rain the district has had. The season will be at its best through to December 5, which is when the festival period officially ends. A camping area has been organized along with toilet facilities, and security for tourists will be provided by police. The official opening ceremony of the festival will be on November 5 and will be presided over by Direk Konkleep, Mae Hong Son governor. According to the latest developments in southern Laos, part of the emerging “Emerald Triangle” in the border region of Thailand, Laos and Cambodia, Highway 16B that links Attapeu Province to Ho Chi Minh City in Vietnam is under construction. The 111km long road is expected to be finished around the Lao New Year in April 2006. The road project has been funded with a Vietnamese loan of USD 45 million. The Lao Government has to pay back the loan with a 5 percent interest rate within 10 years after the road construction is finished. The road condition will be one of the best in Laos with a width of 10 m and super-elevation at every curve. Thus, it will be possible that driving between Attapeu and Ho Chi Minh City could take only two hours. For travellers coming from Thailand it means that in the future travelling from Ubon Ratchathani (Airport) going to Champasak-Salavan-Sekong-Attapeu in Laos to Ho Chi Minh in Vietnam can be finished by less than eight hours or just two hours from Ubon Airport to Champasak, four hours from Champasak to Attapeu and two hours from Attapeu to Ho Chi Minh City in Vietnam. The new highway will raise the awareness for travel to the Boloven Plateau in Southern Laos, one of the less developed tribal areas in Southeast Asia. Another project in the planning stage is that with the funding by the Japanese Government, there will be a new road construction to link Sekong Province with Hue in Central Vietnam. Chiang Mai University is looking for co-operation from inbound tour operators to arrange agro-tourism programs. Chiang Mai University’s Faculty of Agriculture dean, Boonserm Cheva-Isarakul said he saw potential to organize the agro-tourism tours to Doi Chiang Dao in Chiang Mai province but the faculty was inexperienced in the tourism industry and needs the co-operation from tour operators. “We need to find partners in arranging agro-tourism tours because we can provide them with knowledge in terms of scholars,” said Boonserm. At Doi Chiang Dao, tourists can see the forest, flora and fauna. Camping at Kun Chang Kien situated at the rear of Doi Suthep, visitors can find the coffee station and accommodation provided by the university.